Former Assam Chief Minister Tarun Gogoi attending Rongali Bihu celebration at Latasil ground on April 14, 2018. With the Rongali Bihu magic taking over Assam, former chief minister Tarun Gogoi attended the celebration at Latasil ground on Saturday. 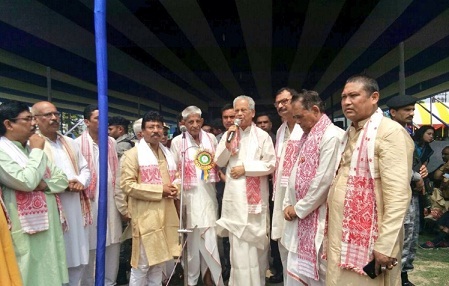 Rongali Bihu brings inspiration and infuses a positive energy among each individual in Assam,” Gogoi said, adding that the festival also strengthens the age-old bond among the communities in the state. Last year the former chief minister and Guwahati MP Bijoya Chakraborty attended the Bihu celebration and the latter played dhol while the former danced to the beats of dhol.